Preston North End manager Simon Grayson believes his side have learnt to close out games after a sixth straight win. 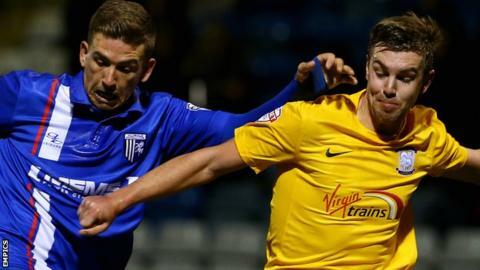 Tuesday's 1-0 victory at Gillingham moved them up to third in League One, and they have two games in hand over the two teams above them in the table. Paul Huntington headed in the only goal, while Grayson's side also hit the woodwork four times. "You've seen over the last few weeks we've certainly begun learning the lessons," said Grayson, 44. "We've learnt our lesson from a couple of weeks ago where we probably didn't manage games as well as we should do." North End finished fifth last season under Grayson but were beaten in the play-off semi-finals by Rotherham. That result meant Preston have now been unsuccessful in all nine of their play-off campaigns, but have been heavily tipped to be promoted automatically this season. "Nights like tonight can lead a long way to where you want to get to, and they've produced a performance," Grayson told BBC Radio Lancashire. "We battled and scrapped when we had to, and we passed it when we got chance to and got into areas where we could hurt them. "At 1-0 you're still waiting for that second goal to kill the game off, and we did have plenty of opportunities, but we saw the game through in a professional manner." Of Preston's six consecutive wins, five of them have come in League One and they could extend that sequence on Saturday when Lancashire neighbours Fleetwood - managed by former North End defender Graham Alexander - visit Deepdale.